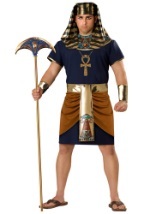 This mummy comes all the way from the haunted pyramids of Egypt. The Kids Movie Mummy Costume includes a cream colored, polyester shirt with ribbed detailing in the front. 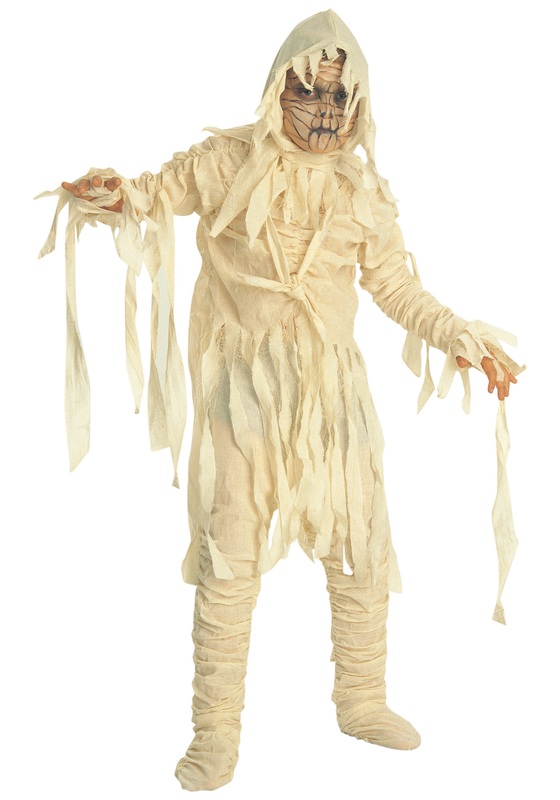 Elastic bands along the chest and sleeves keep the entire chest piece looking rugged and wrinkled for a classic mummy look. The bottom of the shirt features tattered strips of cloth that hang down. The wrists of each sleeve also end in tatters. The matching pants feature elastic bands along the legs, which create a comfortable fit and help maintain a wrapped and tattered look. 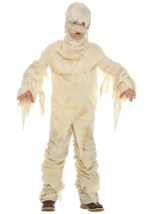 A matching hood with tattered edges fits over your child's head and set of mummy ties can be tied around the chest or arms for additional effects. 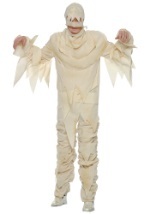 Check out all our classic monster costumes to create a horror movie Halloween spectacular!